Vice article, I can speak from experience that gardening and caring for indoor plants has always been therapeutic for me; in fact, I attribute it to helping me cope with many a stressful or melancholic episode. What’s good for the body is good for the brain, and the toxin-absorbing, air-purifying abilities of plants like pothos, aloe vera, and ivy are worth considering on your next trip to the nursery. Scented plants have health benefits, too: the smell of flowers like jasmine and lavender have been shown to lower anxiety and stress, and promote a good night’s sleep. Researchers have been promoting the mental health benefits of horticulture for decades, and for good reason. Studies have repeatedly shown that the act of tending to plants can take our minds off the bad stuff, relieve stress, and have an overall calming effect. Gardening is so good for your brain that it’s even thought to lower the risk of dementia. One recent study was able to demonstrate that a group of people in their early twenties experienced a massive decrease in blood pressure and other physical stress symptoms when they followed a computer-related task with an indoor gardening session; the results suggested that tending to indoor plants “reduced physiological and psychological stress, especially in comparison to mental tasks performed using technology. The science is pretty clear on all this: humans are happier when they’re close to aesthetically-pleasing living things. Office workers have been found to be more productive and happy when surrounded by indoor plants, and having plants in hospital rooms helps surgical patients recover faster by lowering blood pressure, pain, and fatigue levels. Studies have found that even the literal act of looking out the window at a tiny strip of sad urban park can have restorative mental health properties—which means by investing in a couple of hanging baskets, you’ll actually be ahead of the game. Eyeballing the colour green has been found to promote emotional stability, whereas the presence of bright-coloured flowers can provide an instant mood booster. Perhaps this isn’t too surprising, given that we did evolve and live in nature across millennia, after all. The Yaguas National Park is located near Peru’s border with Colombia in the northern region of Loreto. Its boundaries encompass a land mass roughly the size of Yellowstone National Park but with more than 10 times the diversity of flora and fauna. This is due in large part to the Putumayo River, an Amazon River tributary that runs through the heart of the park. From a wildlife perspective, it’s a rich, varied, and critical ecosystem that’s home to more than 3,000 plant species, 160 species of mammals (like manatees and the Amazonian river dolphin), and 500 species of birds. Perhaps most importantly, it’s a vital piece of the country’s marine ecosystem with approximately 550 fish species that represent a full two-thirds of Peru’s freshwater fish diversity, which is among the richest assemblages of freshwater fish on the planet. The advent of the automobile and subsequent boom in demand for rubber are arguably more responsible for the destruction of Amazon Rainforest land than any human act in history. The park’s creation is a long time coming, and has consequently been applauded by some of the world’s most active and well-respected environmental group. The South American-based Andes Amazon Fund has already pledged $1 million toward the park’s implementation. Beyond the environmental damage, however, there’s been a very real human toll related to the rainforest’s decline. Some 29 communities — including 1,100 people from the Tikuna, Kichwa, Ocaina, Mürui, Bora, and Yagua tribes — call the area home. These are direct descendants of the area’s native people who rely on the land in general, and the endemic fish population in particular, to survive. For millennia, the area has been sacred land to their ancestors. As deforestation encroaches on intact rainforest, Peru is taking the initiative to protect the most pristine areas of its rainforest. Photo courtesy of Mongabay. For the last 25 years, self-described “wildland philanthropists” Doug Tompkins (co-founder of the Patagonia outdoor brand) and Kristine McDivitt worked to collect and cultivate more than a million acres of Patagonia known as Parque Pumalín. The duo’s wish was to forever preserve the land by gifting it to the Chilean people. Sadly, Tompkins died in a kayaking accident in December 2015 and would never live to see his dream fulfilled. With the stroke of a pen, Parque Pumalín became the single largest donation of private land to a government ever in Latin America. But, the story doesn’t end there. Bachelet — a long-time supporter of Tompkins’ vision — bolstered the donation by combining Parque Pumalín with 10 million acres of federal land. To put that into perspective, the combined space will be a staggering 5,000 times larger than Central Park in Manhattan. Combining both Yellowstone and Yosemite would occupy less than one-third of the preserved land. The new order will simultaneously create and interconnect five new national parks and be dubbed “The Route of Parks.” What’s more, the land has long been in use by adventurous travelers, so cabins, trails, and an overall tourism “infrastructure” already exists. While it remains to be seen how well these countries will enforce these protection — Peru in particular is less developed and well-governed than Chile — these ambitious efforts are certainly a welcome move in the right direction. Friends and longtime readers are no doubt well away of my fondness for international rankings of all kinds. So it is nice to spice up the usual indexes of social, economic, or political performance and instead compare countries by the interesting new metric of tree wealth. A team of researchers led by Thomas Crowther of Yale University recently published a study in Nature that looks at where the world’s over 3 trillion trees are located, and how this compares with a country’s geographic size, population, and more. This might seem like an odd attribute to look at — perhaps suited for nothing more than an amusing fun fact — but as the Washington Post points out, trees are an often vital natural resource well worth studying and preserving. [Having] lots of trees in a country provides a huge host of benefits — trees are both a natural resource and an asset to humans. They filter water, combat air pollution, sequester huge amounts of carbon that would otherwise reside in the atmosphere, and even, it appears, contribute to human psychological and health benefits. Indeed, large parts of the world population depend on forests for food. Amid widespread environmental degradation and worsening global climate change, such scientific and public interest in the health and abundance of trees is well founded. Where they naturally exist, they are a barometer for the health, vitality, and sustainability of the local ecosystem. So those nations that have managed to preserve as many trees as possible have much to gain, as well as a lot to offer the world at large. Tree wealth is an apt description. 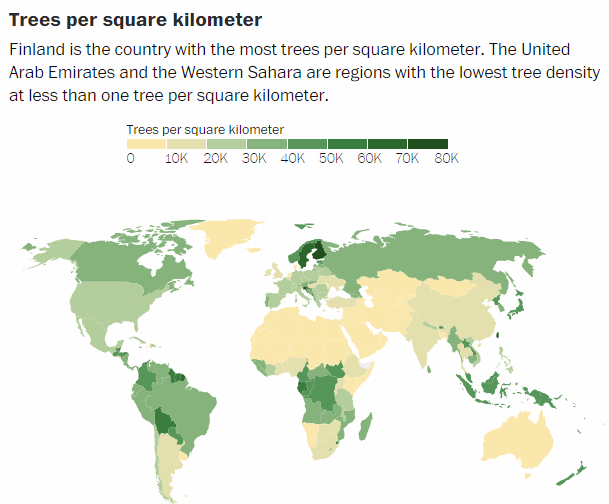 You can find an interactive version in the Post article, which allows you to select an individual country to see its estimated number of trees. 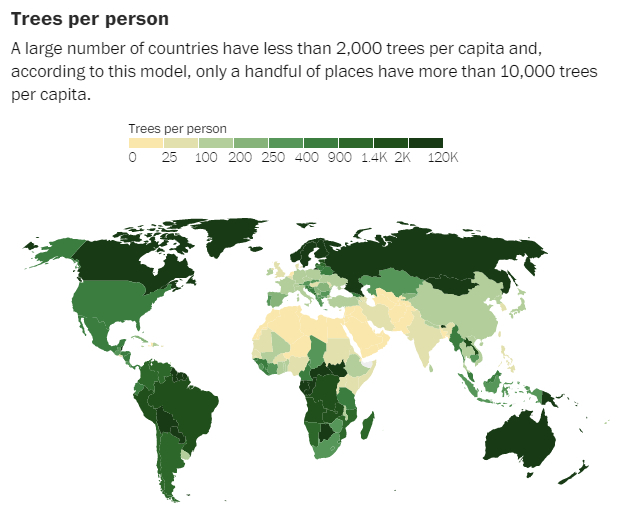 As one can plainly see, the countries with the most trees in total are, unsurprisingly, the largest ones. 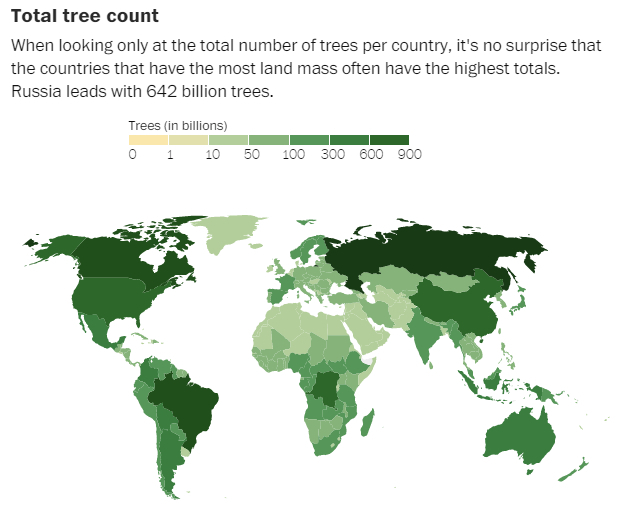 Based on this approach, the world’s overall tree leader is clearly Russia, with 642 billion total trees, followed by Canada with 318 billion and Brazil with 302 billion. The United States is actually fourth overall in this ranking, with 228 billion trees. Other countries with over 100 billion trees include China, with 140 billion and the Democratic Republic of the Congo, with 101 billion. Indonesia comes in 7th, with 81 billion, and Australia 8th, with 77 billion. Adjusting for territorial size, the next measurement looks at tree density, e.g., the number of trees within a square kilometer (roughly equal to a little over a third of a square mile). The difference is dramatic: countries with lots of trees in absolute numbers rank low once you adjust for size. Naturally, this applies most strongly to drier countries, such as the desert nations of Saudi Arabia and Qatar, each with just 1 tree per square kilometer. …in “northern latitudes, limited temperature and moisture lead to the establishment of stress-tolerant coniferous tree species that can reach the highest densities on Earth”. There is more total forest in the tropics, they found, but it isn’t as dense. So the type of forest that a country fosters has a big influence on this metric. Next up is the number of trees per person. One could imagine that countries with large populations would have a lot less tree wealth to go around, especially with the subsequently high need for space, shelter, and farmland. 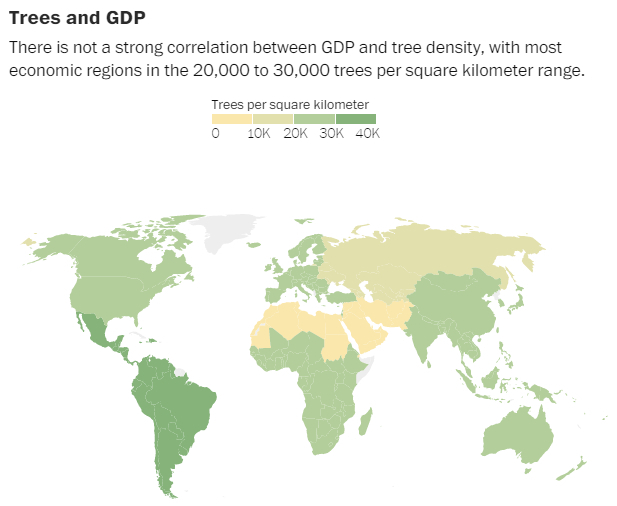 [Once] again … vast northern countries like Russia and Canada are surprisingly “tree rich”, with thousands of trees per resident. There are a whopping 8,953 trees per person in Canada. But tropical countries of the southern hemisphere can also hold their own. Here, Bolivia (5,465 trees per person), Gabon (8,131), and the Central African Republic (5,152) also fared quite well. By contrast, desert countries once again were quite low – Egypt was estimated to have only about one tree per person. The metric is also highly sensitive to population size, meaning that India, with a population of 1.27 billion and a tree population of only about 35 billion, had just 28 trees per person. Very high tree-to-person numbers were clustered in the northeast of South America: Suriname had 15,279 trees per person, Guyana 14,692, and French Guiana a stunning 20,226. Of course, these countries all have populations under a million people. So we have gone over the number of trees as they relate to size, density, and population. But what about wealth? Intuitively, fast-growing poorer countries would seem likelier to strip their forests clean, given the greater need for readily available farmland, fuel, and construction material. Most industrialized nations have moved on to other sources, or have the luxury of more efficient (and thus less land-intensive) agriculture; urban parks and tree planting are also a hallmark of greater wealth and development. Various reports and studies seem to bear this out, too. Ultimately, the researchers concluded that “it was not clear that there was any meaningful difference overall”. Rather, it was simply the case that one emerging country grouping, “Middle East, North Africa, Afghanistan and Pakistan” was quite low on trees — but then, that’s not surprising given the prevalence of desert in these countries. So it seems odd to relate this to economics, rather than simple geography. Simply put, some countries, due to their environments and climatic regimes, just can’t host as many trees as others. “If you said to me, okay, the GDP per capita of Costa Rica is $8,000, I would have no way of telling you how many trees there are in Costa Rica or how dense those trees are”, said Yale’s Clara Rowe. She said that the most meaningful way of looking at the relationship between a country’s wealth and its tree resources would be to calculate a nation’s “forest potential” — how many trees it is actually capable of supporting — and then compare that with how many it actually has, which would then reflect how much the country has exploited those resources, as opposed to preserving them. “That can really give us a better sense of what percentage of forest can be lost in every single country, and then maybe we can start relating that to things like GDP”, Rowe said. But the researchers haven’t done that analysis on a country-by-country level yet. Studying “forest potential” would definitely be the next step. Granted, it is important to keep in mind that there is a big difference between having lots of trees and having lots of forest; a country’s cities might have plenty of trees in its parks, medians, and public spaces, but these would not support the sort of thriving ecosystem as an unspoiled forest would. While trees are important in their own right, for reasons specified earlier, they need to be in abundant number and left undisturbed to support certain wildlife. That would be a whole different sort of wealth to look into. The Atlantic reports on yet another study confirming the benefits of exposure oneself to nature, even for literally a glimpse. A nice walk through a city park can do wonders for a work-weary brain, reducing mental fatigue and improving attention. But if you’re trapped on the high floors of an office tower all day, you can’t exactly break for a long stroll and a picnic. Well, fear not. If you have a view of a nearby green space, like say a green roof, and even just a minute to spare, you can reap some of the same refreshing benefits of urban nature. The findings certainly fit with all that social science has found in recent years about the restorative power of nature. Whether it’s a walk through a park, a stand of trees out the window, or a mere desk plant, natural views give the working brain a breather—to varying degrees—by engaging our involuntary attention centers. The new conclusion that greenery might work its magic in mere minutes is an especially intriguing prospect in a fast-paced work world. And if green roof simulations were replaced with the real thing, the performance outcomes in the current study might even have been stronger. I can certainly vouch for this by personal experience. From my regular bouts of anxiety and depression, to good old fashioned work-related stress, pausing for just a moment to focus on my desk plant, visit my garden, or take a stroll through a nearby park has done wonders. I am glad to work just blocks away from a beautiful public park (and more glad that my job lets me take regular walk breaks). Since I have incorporated this practice into my daily routine, I have seen a notable decline in both the frequency and severity of stress, fatigue, and sadness (although other lifestyle and dietary changes have continued to that as well). But a few minutes is all it takes to try this out and see the difference. Climate change could drive up to a sixth of animals and plants on Earth to extinction unless governments cut rising greenhouse gas emissions, according to a US study published on Thursday. Species in South America, Australia and New Zealand are most at risk, since many live in small areas or cannot easily move away to adapt to heatwaves, droughts, floods or rising seas, said the report in the journal Science. The study averaged out 131 previous studies of climate change, whose projections of the number of species that could be lost to climate change ranged from zero to 54 per cent of species worldwide – too wide to be useful in designing conservation policies. Overall, it found that one in six species could be driven to extinction if greenhouse gas emissions are unchecked and temperatures rise by 4.3 deg C above pre-industrial times by 2100, in line with one scenario from the UN Intergovernmental Panel on Climate Change (IPCC). Large herbivores — elephants, hippos, rhinos and gorillas among them — are vanishing from the globe at a startling rate, with some 60 percent threatened with extinction, a team of scientists reports. The situation is so dire, according to a new study, that it threatens an “empty landscape” in some ecosystems “across much of the planet Earth”. The authors were clear: This is a big problem — and it’s a problem with us, not them. …Between 2002 and 2011 alone, the number of forest elephants in central Africa declined by 62 percent. Some 100,000 African elephants were poached between 2010 and 2012. And the western black rhinoceros in Africa was declared extinct in 2011. “This slaughter is driven by the high retail price of rhinoceros horn, which exceeds, per unit weight, that of gold, diamonds, or cocaine”, according to the study. Well, it is easy conceptually at least. While advanced “negative emissions technologies” (NETs) like carbon-absorbing towers and light-reflecting clouds are touted as solutions to mitigating climate change, the best approaches may actually be the simplest and most low-tech: planting trees and improving soil quality. Charcoal refers specifically to the production of biochar, an ancient practice whereby agricultural waste (such as food scraps, decaying leaves, etc.) is smoldered and then covered by dirt. This not only makes the soil richer, but it helps dispose of a major source of CO2 while also eliminating the need to clear forest for more arable farmland. Forest management is one of the oldest ways that humans have shaped their environment. Before the arrival of Europeans, Native communities in the Americas had been burning forest fires for millenniato support the growth of desirable plants like blueberries and to manage ecosystems. British communities have long practiced coppicing, a tree-cutting technique that keeps forests full of younger trees. It is interesting that the authors also cautioned against viewing NETs as a”deus ex machina that will ‘save the day,'” viewing them instead as just some of the many ways to avoid the worst of climate change still yet to come. That said, reforestation and soil enrichment alone will not solve the problem either; reducing emissions in the first place, in conjunction with these and other methods, is still our best bet. An NRC committee of experts from across disciplines was asked by several U.S. government science and intelligence agencies to evaluate geoengineering proposals. The ideas range from anodyne (planting trees to capture CO₂) to potentially alarming (injecting sulfate particles or other aerosols into the atmosphere to reflect sunlight and cool the planet). Committee members were blunt in their first recommendation: The world should focus first and foremost on curbing fossil fuel emissions rather than on any kind of geoengineering. “I think it’s going to be easier and cheaper to avoid making a mess than it will be to make a mess and then try to clean it up later,” said committee member Ken Caldeira, a climate scientist at Stanford University’s Carnegie Institution for Science. “If we end up having to build a fix that’s on the scale of our energy system, why not just retool our energy system? The first, CO₂ removal, the committee characterized as worthy and “almost inevitable.” The second, using aerosols or other means to reflect solar radiation, would be “irrational and irresponsible” if done as anything but a last-ditch effort to prevent a global famine or other emergency. The Royal Society of the United Kingdom and the Intergovernmental Panel on Climate Change (IPCC) have similarly put an emphasis on reducing emissions first and foremost, with other strategies being auxiliary or complementary. We know the solutions, and have ample resources and capital to draw upon — we just need the political and public will to make it all happen. If merely planting trees, enriching soil, and cutting back on carbon usage are enough to largely avert an existential threat to humanity, then the worsening of climate change is a damning condemnation of our species’ foolishness and shortsightedness. Socotra (also spelled Soqotra) is an archipelago of four islands in the Indian Ocean that is part of Yemen. Evidence of human settlement go back to antiquity, where the island served as a stopover for various trade routes that passed by. However, there are signs of a pre-human presence going back over a million years. Ancient inscriptions have been found written in everything from Aramaic and Greek, to pro-Arabic and ancient Indian scripts. Today, only around 50,000 people live on Socotra, most of them eking out a living as subsistence farmers and fishers. A product of the area’s isolation, they continue to speak a nearly extinct language alongside their own distinct Arabic dialect. 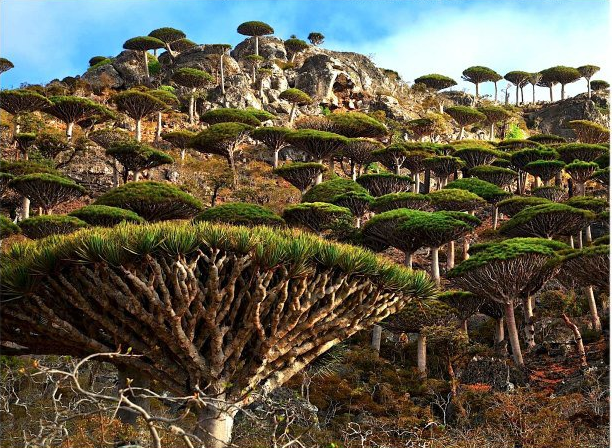 Socotra’s long geographic isolation, combined with its unforgiving heat and dryness, have created a distinct and spectacular ecosystem comprised of flora and fauna found nowhere else in the world; nearly 700 species are unique to the area (only Hawaii, New Caledonia, and the Galapagos Islands surpass it in terms of sheer biodiversity). For this it has been recognized as a world heritage site and nicknamed the Jewel of the Arabian Sea. Among the most famous occupant is the dragon blood tree, so named for its crimson red sap, which was highly valued for centuries as a dye, medicine, glue, lipstick, and even breath-freshener. Because it was believed to be dragon’s blood — a fact that could not be unverified in ancient times given the island’s seclusion — the sap was also valued in alchemy, and even today many inhabitants of the island and nearby areas allegedly regard it as a miracle cure for all sorts of ailments. Socotra continues to retain its centuries-long mystique and character, offering an often alien landscape that is found nowhere else in the world.